A reference to the creation of electricity; especially, by living organisms. 1. Relating to electrokinetics or having to do with electricity in motion. Conditions associated with relative movements between a charged surface and an electrolytic solution. The surface is ordinarily either a solid particle suspended in the solution or the medium through which the solution flows. An instrument that converts dynamic physical forces into electric signals. 1. Created by or relating to electromagnetism; that is, the interaction of electricity and magnetism. 2. Involving or relating the interaction of electric and magnetic fields, both static and dynamic. 3. A reference to magnetism that is induced by an electric current. 4. Pertaining to radiation; such as, light, microwaves, X-rays, gamma rays, or radio waves. 5. Referring to the combined electric and magnetic fields associated with radiation or movements of electrons or other charged particles through conductors or space. Microphones in which the voltages are varied by an electromagnet; such as, ribbon or velocity microphones, dynamic or moving-coil microphones, and reluctance or moving-vane microphones. Ribbon or velocity microphones are those in which electric output depends on the velocity of the air particles that form a sound wave; examples are a hot-wire microphone and a ribbon microphone in which the conductor is a thin ribbon of aluminum alloy moving perpendicularly in a magnetic field. It is strongly directional and can be used to reduce unwanted side noise. Dynamic or moving-coil microphones consist of moving-conductor microphones in which the flexible diaphragms are attached to a coil positioned in the fixed magnetic fields of a permanent magnet. Reluctance or moving-vane microphones consist of diaphragms acted upon by sound waves that are connected to armatures which vary the reluctance in magnetic fields each of which is surrounded by a coil. 1. An identification with and an understanding of another person's feelings, situation, or motives: Ursula's work with the street people gave her considerably more empathy for the homeless than she had ever had before. 2. Etymology: from Greek empátheia, "passion"; from em-, "in" + páthos, "feeling". 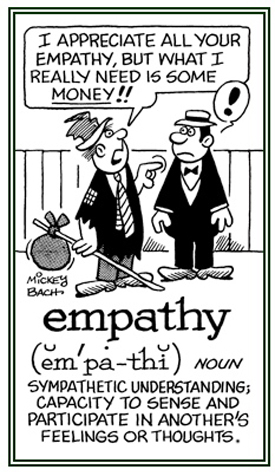 Empathy was apparently borrowed in 1904 from Greek empátheia, "passion"; ; from em-, "in" + páthos, "feeling". It was a translation of the German Einfühlung (ein; in + Fühlung, feeling), a word which was introduced in 1903 by the German philosopher and psychologist, Theodore Lipps, who originated the theory of aesthetic empathy, "the art of appreciation depends on the viewer's ability to project his personality into the object". The Barnhart Dictionary of Etymology, edited by Robert K. Barnhart. True empathy is when another person strikes it rich and you feel as if it’s money in YOUR pocket. 1. A reference to the deformation of the earth's crust by which the broader features of relief are produced. 2. Having to do with the uplift or depression of the earth's crust, affecting large areas of land or ocean bottom. Showing page 7 out of 8 pages of 112 main-word entries or main-word-entry groups.